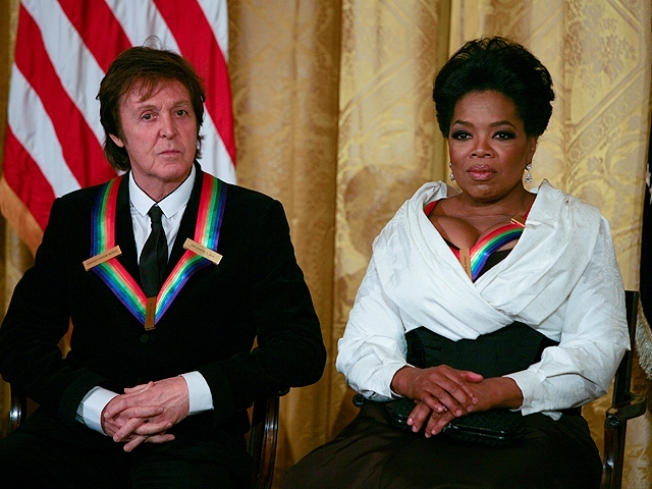 Paul McCartney and Oprah were recognized at the 33rd Annual Kennedy Center Honors. When The Beatles were storming America, Oprah Winfrey had the band's poster on her bedroom wall, Merle Haggard was free from prison, Jerry Herman was making Broadway sing and Bill T. Jones was not yet a dancer but growing up in a migrant labor camp. On Sunday, these leading artists who followed divergent paths since the 1960s will join Paul McCartney to receive the Kennedy Center Honors. They'll hear accolades from President Barack Obama and stars who will perform as part of the nation's top prize for those who define U.S. culture through the arts. Secretary of State Hillary Rodham Clinton hosted a dinner Saturday for the honorees, along with visiting celebrities, including Julia Roberts, Claire Danes, Steven Tyler from Aerosmith, and Gwen Stefani and her band, No Doubt. The guestsalso included veteran entertainers Carol Channing, Angela Lansbury and Sidney Poitier. Clinton marveled at the diverse "genres and generations" of artists. "I am writing a cable about it, which I'm sure you'll find soon on your closest website," she joked after a week of dealing with fallout from the WikiLeaks release of confidential diplomatic dispatches. She also confessed to "several waves of teen girl hysteria" over The Beatles during her youth. Clinton said McCartney's life had connected people around the world. The former Beatle, making his second visit to Washington this year for a culture award, said the admiration is mutual. In June, he won the Gershwin Prize for Popular Song from the Library of Congress. "You know, great things just come in bundles," he said. "I am a big fan of this president, and I think he's a great man whose got some difficulties. … I'm very honored to be with him and his family, and I'm also a big fan of Hillary's, too." Since the 1960s, the new Kennedy Center honorees have helped define television, dance, theater and music. For Winfrey, the prize comes during the 25th and final season of her talk show and just before she launches her new cable network, OWN, on Jan. 1. After her Washington visit, she will take about 300 members of her audience to Australia for a vacation over the holidays. "You know what's interesting is she spends her life celebrating others, but when it comes time for her, she's very reluctant really," Winfrey's best friend Gayle King told The Associated Press. King said it was a fitting tribute for Winfrey as a communicator, actress, producer and humanitarian. "They're recognizing her whole body of work," King said. "She's not just a talk show host." Performers who will honor Winfrey and the others will be a surprise untilthey appear on stage Sunday night, but Winfrey has admitted she doesn't like surprises. At the State Department, the ornate Benjamin Franklin room was a swirl of Hollywood, Nashville, New York and Washington power players, including President Bill Clinton. Roberts said it was both exciting and nerve wracking. She said the mix of art and politics "can converge in a very interesting way, so when it's done right, it's really exciting." After the honors were announced in September, Jones, the son of potato pickers, said he could recall dreaming of big things as a 9-year-old boy in upstate New York. He went on to create the Bill T. Jones/Arnie Zane Dance Company in 1982 after college with his late partner Arnie Zane. His work has tackled racism, AIDS and other tough issues, sometimes sparking outrage. Jones said he's often felt like an outsider, yet he's being honored for helping to shape the country. His portrait also is included in a current Smithsonian Institution exhibit, the first to explore the impact of sexual orientation on art history. The exhibition has recently drawn complaints from conservatives. Opera singer Jessye Norman, who toasted Jones' work Saturday, said she admired him for being brave enough to stand alone at times in his advocacy on social and political issues. "I can feel the love," Jones said of the honor, adding that he was thrilled to be receiving the award while Obama is president. Still, he said he is discouraged by the country's direction. "I am trembling a little bit, actually. The discourse is so poisonous." In recent years, Jones has shared his talents with Broadway, winning Tony awards for his choreography in "Spring Awakening" and this year for his show "Fela!," playing currently in New York and London. He said he hopes more artists will bridge the gap between the dance world and mainstream theater. "We don't want to be marginalized anymore," he said. "Indifference is worse than dislike." The Kennedy Center Honors gala will be recorded Sunday night for broadcast Dec. 28 on CBS.